"It's not our first rodeo." It's not just humans bracing for Hurricane Irma. More than 2,000 alligators are hunkering down at the Gatorland wildlife reserve in Orlando, Florida, as park officials assure tourists and locals not to worry ― these gators aren't going anywhere. Dozens of alligators are seen basking in the sun along a shore at Gatorland in Orlando, Florida. "This isn't our first rodeo," park director Mike Hileman told HuffPost on Saturday as his employees prepared to close the 110-acre theme park, located roughly 20 kilometres outside of Walt Disney World. "We have a detailed hurricane procedure in place," he assured. "We have double fences, a large perimeter fence that goes around the entire property." The assurance came just weeks after Hurricane Harvey struck southeastern Texas, with its powerful floodwaters threatening the release of hundreds of gators from Gator Country, an animal sanctuary in Beaumont. There, water nearly flooded over fences surrounding their reptiles, threatening their enclosure. 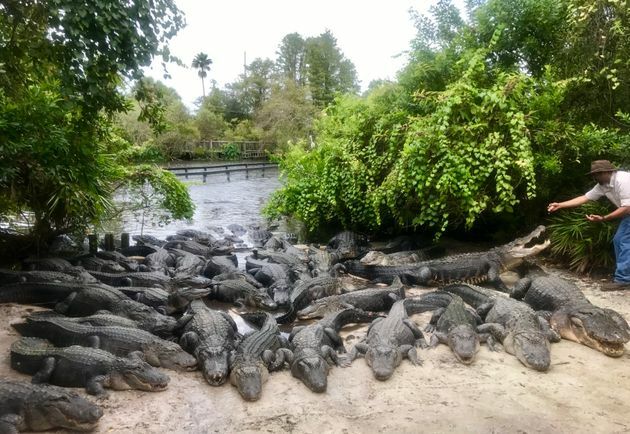 At Gatorland, where the largest gators are four metres (14 feet) long, Hileman insisted that even if one of their 2.5-metre-tall (eight feet-tall) fences gets destroyed or blown away, "they are still not getting off of this property." That's even with most of the gators preparing to ride out the storm in their outside pools. Many of the park's other residents ― including panthers, bobcats, goats, birds, raccoons and snakes ― had to be moved inside, he said. Videos taken inside the park on Saturday showed Gatorland employees carrying pythons around their shoulders and legs as they moved the reptiles to secure facilities. Another video showed what appeared to be dozens of baby gators being moved into a fresh pool of water. Then there was Bullet, one of the park's smaller gators that was born with just three legs. That little guy was filmed relocating alongside employee Savannah Boan. "Come on, let's go for a walk!" she cheerfully called to him as he shuffled at her feet. The moves came as South Florida braces for maximum sustained winds of 201 km/h. As of Saturday evening, Central Florida is expected to see major flooding from rain as well as structural damage to buildings due to high winds, according to the National Weather Service. Hileman, however, assured that they're ready for anything. In addition to the fences surrounding the property, the grounds are equipped with a water pumping system, which would allow employees to lower the water levels if it gets too high. A five-person team will also stay on the property throughout the storm, allowing them to monitor its fences should they fall or get destroyed, he said. "Once the winds are around 30-35 mph (48-56 km/h), they'll go out to check perimeter fences," Hileman said. In a video posted to Facebook Friday evening, the park's president and CEO Mark McHugh posed with several gators along a packed shoreline where he repeated the assurance: "None of our animals are getting out." "We've been fighting big hurricanes and nasty storms since 1949," he said, referencing the date the park first opened. "If you see an alligator floating down the street right by your house, it ain't ours. Don't call us. Call the Florida Fish and Wildlife Department."